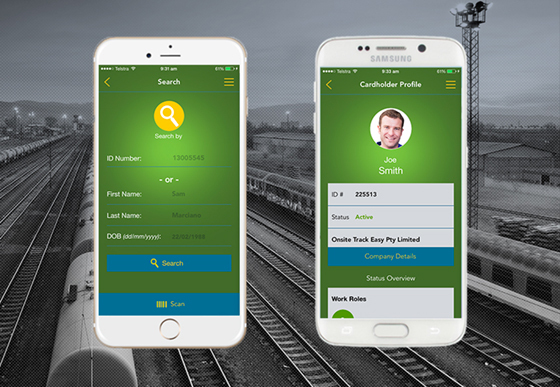 When your Rail Industry Worker application is approved, authorised users nominated by your organisation will be sent login details to access the RIW system through the Onsite Mobile App. Once downloaded, the app allows you to check compliance and status in the RIW system from your mobile device. Who can download and access the RIW app? Only those with certain roles can access the RIW system from the Onsite Mobile app. The Rail Industry Worker team has an approved list, which is detailed for each operator below. If your role is not listed below and you are responsible for checking proof of worker competence, please liaise with the appropriate operator. Find their details on the contact page. Once you have download the Onsite Mobile app, you may login using your RIW details (if you are an approved user) from your mobile device. Please note: The app will soon be available on Windows Media devices. Check back soon! Why is there a new version of the RIW App? The new version is a native app, which means it’s like other apps downloaded to your phone from the Google Play or Apple App Stores. The Onsite Mobile app is fast and intuitive, with a modern design. Can I use my current username and password to login to the native app? Yes, your RIW username and password will be used to access the app if you hold the correct role (listed above) for access. Will installing the native app automatically delete or override the web version of the app on the same device? The web version wasn’t downloaded from the App Store or Play Store and so this native Onsite Mobile App won’t delete or override it. Does the native app still require a QR reader to be installed for use? No, all functionality needed is included in the app – including its own QR reader. Will the web-based app sync with this native version and show the same information? Both apps use the same data services and, therefore, identical data. They are located on different servers, though – the web app internally and the downloaded (native) Onsite Mobile App hosted by Apple and Google. How long will the web-based app remain available? Pegasus will monitor to learn when the web-based app is no longer used and will communicate its retirement. What if my RIW subscription has expired? If your subscription in the RIW System has expired, then your roles and competencies will not be visible to auditors in the Onsite Mobile App until it is renewed. This may result in site access being denied. Click Register/Login at the top of this page to go to the system to check and update RIW subscriptions (cost $30 + GST annually).